Robben Island is not any ordinary island in the sea but has a long history of political imprisonment with the great leader Nelson Mandela being one its most famed political prisoners. 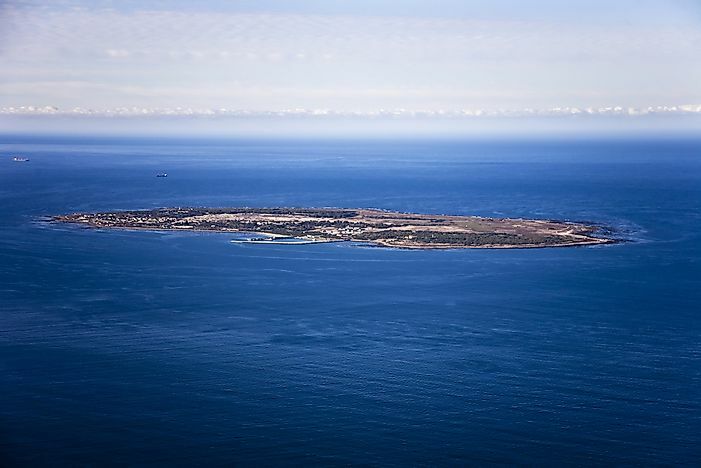 An aerial view of Robben Island in South Africa. Robben Island is located in the Table Bay, 6.9 km from the coast of Bloubergstrand, Cape Town, South Africa. The roughly oval-shaped island is about 3.3 km long and 1.9 km wide. It covers an area of 5.07 square km. The island is quite flat in nature and erosion has reduced its height close to the sea level. The island is open to tourists and can be easily visited from the tourist hotspot of Cape Town. The island served as the site of imprisonment of Nelson Mandela, the most prominent figure of the anti-apartheid movement, and the country’s former president and a Nobel laureate. Mandela spent 18 years of his 27-year old jail term on this island. Two other presidents of South America, Kgalema Motlanthe, and Jacob Zuma were also inmates of the jail at Robben Island. Currently, the island serves as a symbol of the people’s struggle to achieve freedom from racism and thus is a South African National Heritage Site. As of 1999, UNESCO also recognizes the island as a World Heritage Site. Robben Island had served as a place to isolate political prisoners since the end of the 17th century. The first to use the island as a prison were the Dutch settlers who imprisoned various political leaders from Dutch colonies on the island. A whaling station was opened on the island by John Murray in 1806. During the fifth of the Xhosa Wars when the British defeated the natives Xhosas of the region, the African leader Makanda Nxele was sentenced to life on the Robben Island. He died by drowning while trying to escape. The island was also used as a leper colony and a quarantine station for diseased animals. The South African government used the island as a prison for political prisoners and convicted criminals. Both the prisons were later closed down. The former was closed in 1999 and the latter was closed five years later. The island is currently visited by thousands of tourists via a ferry from Cape Town’s Victoria & Alfred Waterfront. A large number of the guides working here were former inmates of the prison at the island. The place reminds one of the dark days of the past and the hardships faced by famous world leaders like Nelson Mandela during their time spent on the island. Navigating near the Robben Island is not an easy job. The island has a jagged coastline and a rough Atlantic swell prevails in the region around the island. 31 known vessels have been reported to have wrecked around the island. Robben Island supports a significant population of penguins which is a great magnet for tourists. The penguin population of the island is, however, falling due to unidentified causes, although food scarcity has been mentioned as a possibility.